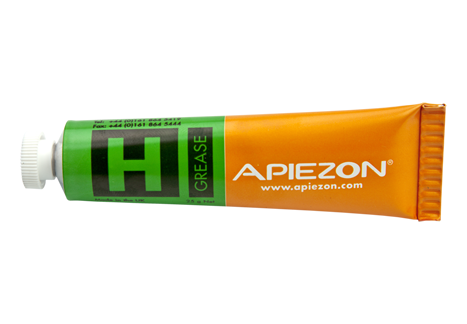 When it comes to high temperature sealing or thermal conduction across a very wide temperature range the best grease in the Apiezon range is H grease. It will not melt and is suitable for temperatures up to 240°C, but will also work down to -10°C. If H grease is used at the upper end of its temperature range then it does get quite stiff and sticky, but it is still easy to remove. Our laboratory regularly use H grease up to 240°C and they report that manually removing the majority of the grease, followed by a wipe with toluene (or other hydrocarbon solvent) will get rid of all traces. The same might not be true of some other high temperature greases, which can be a bit of a pain to remove completely, unless you use specialised solvents. The stickiness of H grease actually makes it really useful for sealing laboratory glassware, without the risk of it working loose. This avoids that expensive crash which every lab technician dreads. It also makes H grease very good for acting as a thermal contact material on electronic components, as it has excellent thermal conductivity and will stay put. Along with very low vapour pressure this has lead to H grease being used in spacecraft computers as a heat sink compound.